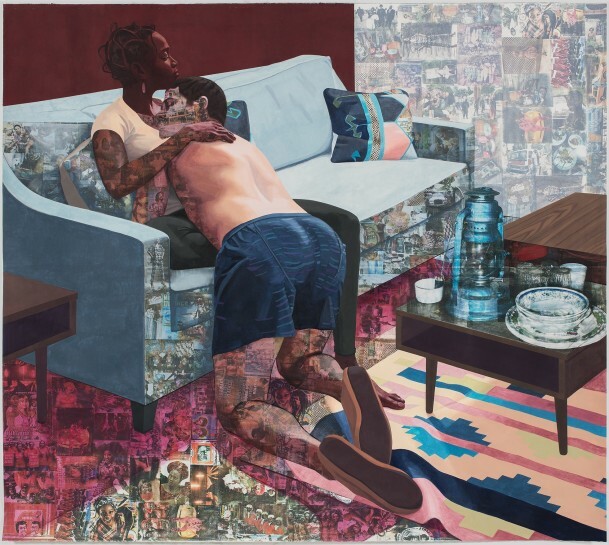 Njideka Akunyili Crosby’s paintings exhibit both a generous opulence and a tender grace, taking small moments of intimacy and imbuing them with a meticulously ordered magnificence. Mama, Mummy and Mamma (Predecessors #2), 2014, is exemplary of her approach, presenting a domestic interior with the monumentality and structural organization of a Renaissance-era sacra conversazione. Like much of Akunyili Crosby’s work, this piece is wrought on paper, its painted image scored by numerous photo transfers that dissolve the painting’s surface even as its muscular linearity and bold colors work toward compositional unity.